The theme of this month’s challenge is “reflection”. I think both Dave and I had a tougher time finding something we liked, mainly due to time restrictions. But that’s what this is all about – pushing ourselves to get out there more and submit whatever we have when the deadline hits. We set a deadline so that we can’t procrastinate or simply not submit anything until we get the shot we wanted. Anyways, on to the results. Dave managed to capture this awesome shot of Llynnau Mymbyr lake, in Snowdonia, Wales with a point and shoot and no tripod! I haven’t made it further than the movie theatre lately, so after the show I spent some time in the very cold streets with my camera. This was taken standing in front of a store window in uptown Waterloo. There are several reflections here, the primary one being the mannequin in the mirror. I converted to a red filtered B+W to lighten the reddish hues that were coming off the mirror details and the other reflection of the mannequin in the opposite window (right side of the frame). I also cropped the shot (this was wide angle, so there was a lot of extra junk in the frame) and softened the edges to decrease the distracting details in the periphery, keeping the focus on the contrast of the dress and the mannequin. Details are: 55mm at f5.6 amd ISO 1600 for a 1/40 second exposure. This entry was posted in Architecture and Design, Details, Landscapes, Monthly photo challenge, P&S, Travels. Bookmark the permalink. It almost has a 3D look to it Mike. Nice shot. Tried hard, but I couldn’t see your reflection anywhere! I love how both of your shots are so different and yet both fit “reflections”. Nice work to both of you! I have heard of Snowdonia… wish I could go. The photo is beautiful! 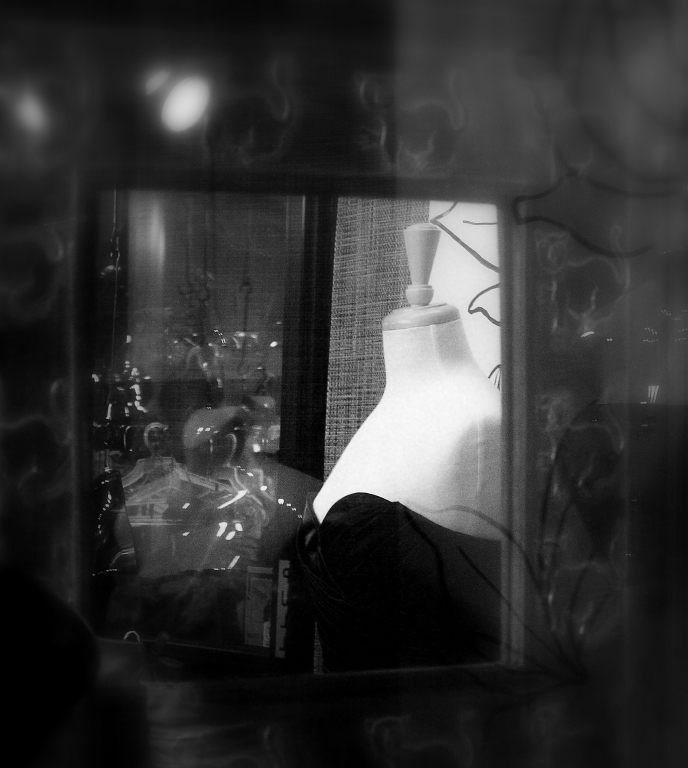 And I love all the details you captured in the window display! I really love your photography Mike. Everytime I look I’m impressed.